The simplest improvements brought about by technology can help make someone’s day. But nothing is more important to Christina Gan and her team at MSF, one of GovTech’s partner agency sites, than listening to feedback from citizens and VWOs before proposing ideas that can meet their needs. It might not seem like much to some, but for Christina Gan, the happy smiles on the faces of the elderly is a huge motivation for her to go to work each day. Christina has been the programme director for the Social Service Infocomm Technology (SSICT) Programme Office under the Ministry of Social and Family Development (MSF) since 2012. She requested to join this sector because she wanted to focus on people and be a part of something that would benefit others. “I just want to put enough technology to make a difference to people’s life,” she says. As SSICT’s role is to introduce infocomm technology to help government and social service providers coordinate and work better to deliver social services, it is here where she gets to interact directly with social service providers and their beneficiaries who will stand to gain from her team’s initiatives. After a three-month review of the sector, which included some 450 Voluntary Welfare Organisations (VWOs) and statutory boards, she decided to embark on a “major endeavour” that she feels will help solve the issues of beneficiaries – that of continuously repeating their background story to different agencies. The idea arose because they realise that there are times when one contact point cannot offer all the relevant help that their clients’ – typically citizens from the lower income or vulnerable groups – need, and the case would have to be referred to another partner, explains Christina. After hearing the challenges their clients constantly face, Christina and her team at MSF came up with SSNet – a shared platform that collates and stores client information gathered from the VWOs. The answer is the Social Service Net, or SSNet – a shared platform that collates and stores client information gathered from the VWOs. As privacy is a key concern, only those who are servicing the client will be granted access to their particular data. Still, admits Christina, the team faced plenty of obstacles, such as getting buy-in from VWOs and helping them to understand the technology behind the system. The intensive engagement took months, with hundreds of workshops and focus groups targeting people within various levels in the organisations. Many VWOs were also not tech-savvy. Thus, in phase one of the project, she had to place a roving team at each VWO site to help in problem-solving. This takes a lot of patience, which thankfully, her team of 25 members has. Christina’s team knows the importance of listening and understanding the condition of the VWOs before coming up with a possible solution. Christina credits her team, which is made up of “very adaptable folks” comprising seasoned and experienced members as well as new recruits who have many fresh ideas. They demonstrate agility by building a “minimum viable product” – a system with the right essentials to support service delivery. “We didn’t want to overload it. We wanted to talk to each VWO, understand their needs and then see what we can do with them first. Overtime, we’ll build in new features and grow it,” she explains. The SSNet initiative is progressing as planned. Phase one, which saw 75 VWOs come onboard, was completed early last year after a two-year journey. The team is now in the midst of phase two, where they are targeting 280 more VWOs. Their efforts have already garnered recognition – they received the Best Practice Award (Service Delivery) at the Excellence in Public Service Awards (ExPSA) 2017. Last year, they also received a certificate for being a semi-finalist in the Commonwealth Association for Public Administration and Management Awards. “We were very happy. We didn’t do this for the awards; we did it because we were highly motivated to help people in need,” Christina says. The recognition, she adds, is a celebration of the collaborative efforts between the VWOs, MSF, and its partners. Christina and her team have also embarked on other innovative projects – all with the aim of making things much easier for their beneficiaries. An example is a robotic coach – created by polytechnic students with the help of their lecturers and the support of Christina’s team. Her team helped to be the “matchmaker”. They organised sessions with a senior activity centre to brainstorm ideas, before helping to shape a possible technological solution for their needs. They then found a willing party to create the robot and sourced for funding to help them out. 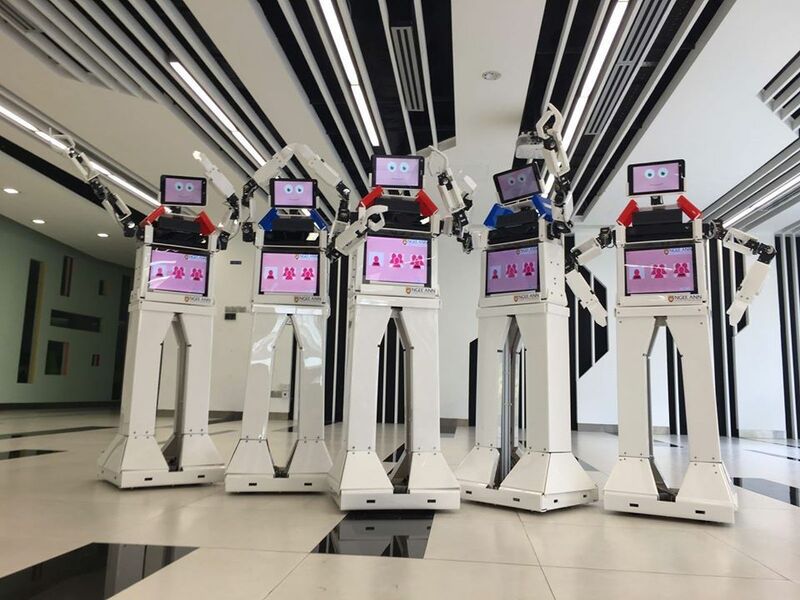 There are now five robots in senior activity centres, each with a unique name - May Ling, Jian Kang (healthy in Mandarin), Le An (happiness and peace in Mandarin), Bao Bei (baby) and Ross (short for Robot for Seniors). 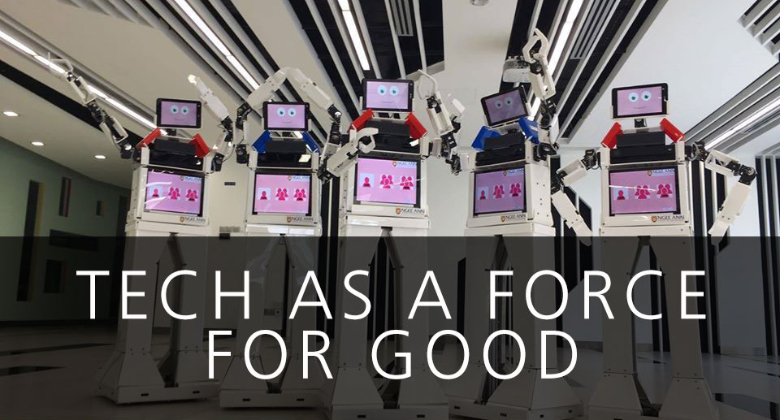 The robots conduct exercise lessons for the elderly and speak English, Mandarin and Cantonese. “I heard the seniors say they love the robot,” Christina says, smiling. The team also devised a simple application where seniors can tap on tiles on a touchscreen Windows tablet to choose the activities they wish to participate in. That might seem like a simple task we all take for granted, but the act of tapping on a tile, coupled with a beep that sounds with every successful transaction, is an experience that the seniors enjoy very much, Christina says. Speaking to Christina, you would find someone who is bubbly and optimistic, a people–person. But one major incident she experienced made her realise how fragile life is, and reinforced her belief in doing more meaningful work that can help people. Christina was in Tokyo for a work trip in 2011 when the 9.0 magnitude earthquake struck the country. She was on the 33rd floor of a technology firm, having just stepped out of the lift, when the building began to sway before shaking violently. She and others in her group had to wait there for hours until it was safe to make their way down to the ground floor, before walking for 45 minutes back to their hotel. The experience was extremely stressful, she says, and the trauma still stays with her whenever she recounts what happened on that day. “I was glad to be back. When I saw my family, all my emotions came out. That incident was one point in my life where I reflected and realised what was more important to me,” she recalls. To de-stress, she plays golf, goes out for meals with her team, and spends time with her nephews and nieces. 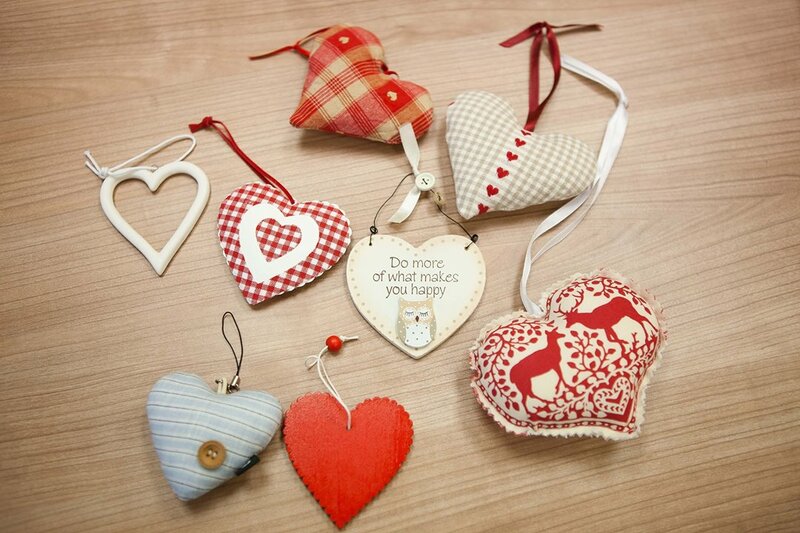 She also collects heart-shaped ornaments – a hobby she began after she joined MSF. “I wanted to remind myself that with this job, you need to give from the heart,” she says with a smile.